It’s after 9:00 pm and my head is spinning from the great number of products I saw at the Consumer Electronics Show in Las Vegas today. I’ll list the top 10, which I must admit that the top one will be the least technical, but for me the most useful. As with my previous blog, I’m skipping those items that are covered by the major media such as the prototype of a new “distributed” fridge where each part of the fridge is separate (eg a chilled, covered bowl for fruits, a separate tray for cheese that requires less cooling, etc) or the many different displays and headphones, focusing on the lesser known but interesting items. 10. 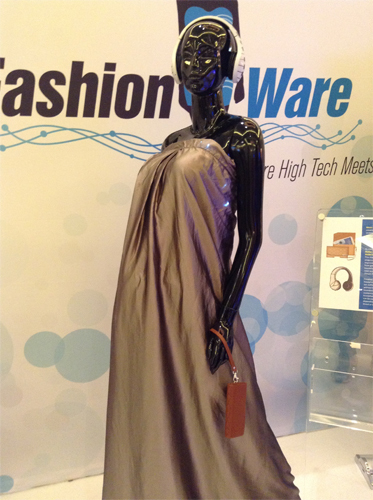 A dress that has small, built-in lights and processor, that allows the wearer to control when and how the (small, Xmas tree like) lights turn on. I think if you need a dress to light up a room, there are more issues than a questionable use of technology. 9. Robot Cube-lets form construction kits for children, sort of like big Lego pieces, that snap together as the cubes are magnetic. Each cube has special characteristics, such as sensing light, temperature, distance from each other. The blocks are about $30 each. 8. I’m Smart Watch is a small version of a smartphone with a size of about 2″ by 1.6″. It allows taking phone calls, looking at email, contacts, SMS and many other functions. It reminds me a bit of the Get Smart shoe phone, just smaller. It is a great device for people who always want to be connected and want their hands free to do other tasks. 7. For the person who has everything, Alphyn industries make pants that respond to our communication needs, by having a special pocket to have the smart phone connected. For about $160 you can have these smart pants and be the “smarty pants” in the crowd. 6. 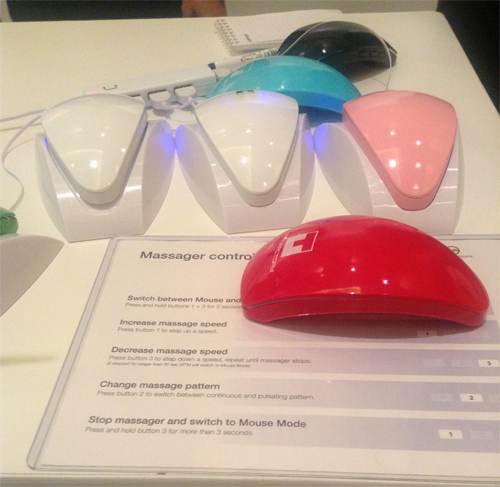 A mouse that is more than a mouse, the Massage-touch-mouse is more than just a wireless mouse with 3-button control, it is also a massager when not in use as a mouse. I did test it (what would I not do for this blog?) and it does do a nice, gentle massage. 5. If you are the worrying parent, MMGuardian is just for you. It claims to offer a way that parents can control their children’s smart devices through their phone. The software can locate and track their child’s phone, prevent texting while driving, locking or unlocking the phone remotely and similar functions. The software is meant for teens and pre-teens, though I know some adults who would benefit from such controls. 4. 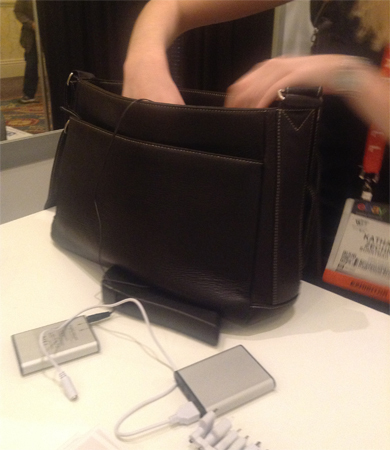 Sunny Bags are bags and backpacks with solar panels that provide constant charge to the battery that can recharge all of your devices. The purse looks nice and unless you know it, you can’t tell there are solar panels; it costs around $300. If that’s too expensive, you can buy the solar panel and a less expensive (but not as nice looking) backpack from Solarwalker. 3. 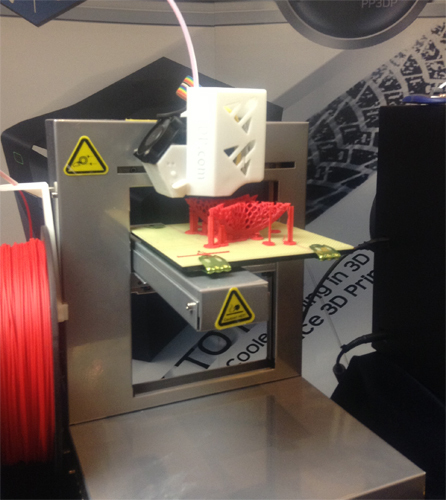 The 3D printer (www.up3Dusa.com) was really cool, it took the drawing and printed it like a real object. The one I saw had the drawing of a rather fancy lady’s shoe and the printer created a 3d version of the shoe by using small drips of plastic. The printer is around $1,000. 2. The MVB Disko advertises itself a down to earth file management device. It is a small (about 2″ x 3″) USB stick that allows you to store, access and share folders for about $30. And if that wasn’t enough, the device is also an MP3 player, voice recorder and FM Radio, but does not peel potatoes. 1. The one product I found most useful is the Fly Grip. 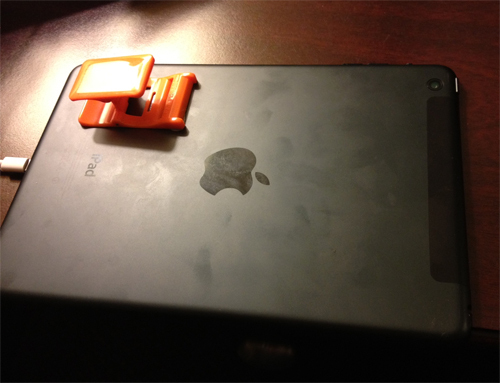 It allows me to really hold on to my iPad mini. It is a 2″ by 1″ piece of plastic with a part you can grab onto. There are other devices similar to it at the CES like a ring that you glue on the back of the iPad mini or a semi sphere that does the same. The difference with fly grip is that when you don’t use it, it folds flat. I have been using it all day today and it worked well. The only issue is the price, at just under $30 is a bit expensive. 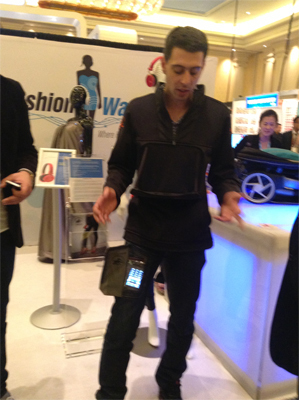 So that’s it, the list of ten and my last blog on the CES. I’m leaving tomorrow, but did enjoy it in a weird torturous way. Next year, if I do come to the CES, I’ll do some things differently. I’ll focus more on the conference and not so much on the miles of booths. I’ll also be better prepared for the huge crowds, the pushing and shoving. It is a great place to learn about trends (interconnectivity of everything is the direction this year and mobile devices are it) and look at the future of technology from the consumers’ point of view. Thanks for following my blog and I appreciate your comments and questions. Dr. Catherine Aczel Boivie is a widely respected executive with over 30 years of experience in the leadership of advancing the value of information technology as a business and education enabler. Prior executive roles includes: CEO Inventure Solutions and Senior Vice President of Information Technology/Facility Management for Vancity Credit Union; SVP of IT and Chief Information Officer at Pacific Blue Cross and Canadian Automobile Association of British Columbia. Catherine is also an experienced board member serving on several boards, including those of Commissioner for Complaints for Telecom-television Services, Canada Foundation for Innovation and MedicAlert Canada. Dr. Boivie is the founding Chair and President of the Chief Information Officers (CIO) Association of Canada that has over 400 Chief Information Officers as members across Canada. She has been publicly recognized for her contributions, including being named as one of Canada's top 100 most powerful women by the Women's Executive Network in the "Trailblazers and Trendsetters" category and the recipient of the Queen Elizabeth Diamond Jubilee medal for being a "catalyst for technology transformation".